Only 6 left in stock at this price! If you colour you hair you need a shampoo, conditioner and a good hair mask to treat and nourish your hair with. Why a specially designed one you may ask. Shampoo is shampoo...right?!? Noooooooo, most definitely not! When you colour you hair you want to keep that colour for as long as possible, so you want a product that don’t strip your hair of its colour such as Bed Head Colour Goddess. The shampoo contains vitamin E, pro-vitamin B5, sweet almond oil, coconut oil and keratin which has been proven to not only nourish your hair but also enhancing your colour and leave you frizz free. The Bed Head Colour Goddess Shampoo has a sweet toffee scent. The conditioner is infused with sweet almond oil which will add a layer of water repelling agents on your hair, without it feeling heavy. The shea butter is perfect as a natural conditioner and will furthermore help you keep your locks frizz free. The Bed Head Colour Goddess Conditioner has a sweet toffee scent. The Colour Goddess Treatment Mask combines Keratin, Pro-Vitamin B5 and oils to moisturise and condition your hair. Use it once a week for that extra bit of TLC to keep your hair vibrant, healthy and nourished. 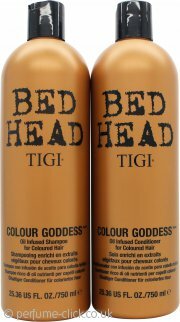 Tigi Duo Pack Bed Head Colour Goddess 750ml Shampoo + 750ml ConditionerLove it but maybe another scent?